Wisconsin is hoping people still associate Fonzie with their state, rather than Paul Ryan. MILWAUKEE, WI - (@The Comedy News) - Wisconsin democrats are scrambling to remind the rest of the country that Wisconsin is not nearly as uncool as Republican Vice-Presidential nominee Paul Ryan. "We need to make sure that not only do Romney and Ryan lose this November, but that people who have never been to Wisconsin still think of cool pop-culture references that are loosely associated with our home state," announced Milwaukee Mayor Tom Barrett. "While I support the liberal media's haranguing of Paul Ryan for cutting funds for seniors, students, veterans, the sick, and women, we need to make sure Wisconsin's charm isn't brought down with that blue eyed hack." 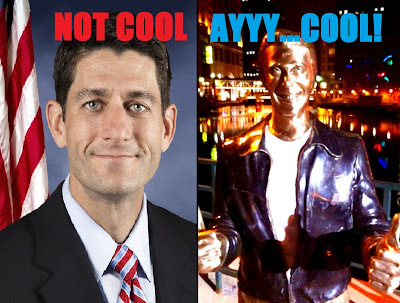 Part of Mayor Barrett's plan is to do all of his speeches at the site of a statue of "Happy Days" main character Arthur Fonzerelli---otherwise known as the Bronze Fonz---on the downtown banks of the Milwaukee River. The show, which lasted from 1974-1984, took place in Milwaukee. Fonzie's "cool" has rubbed off on Milwaukee for almost 40 years. The city of Milwaukee is also organizing atown hall meeting at Miller Park, where Alice Cooper and his bandmates will take questions and answers about the history of Milwaukee and it's Algonquin meaning, "The Good Land". Other tactics to distract the country from associating Paul Ryan's toxic political views from the state of Wisconsin as a whole include ad campaigns touting the University of Wisconsin's groundbreaking work with stem-cell research, the opening montage to Lavergne and Shirley, and tourists' capability to get piss drunk from all of the Wisconsin's microbreweries for less than $20.